Precast concrete is simply concrete that is cast somewhere other than where it will be used. Most precast products are cast in a factory using a wet-cast method, but others are cast on site—such as tilt-up panels. There are lots of reasons—mostly advantages—why one would precast, and we'll get into those, but the biggest negative of precasting is that the resultant concrete item must be moved. Concrete is heavy—typically about 150 pounds per cubic foot—so concrete elements don't have to be very big before moving them becomes unrealistic. Some decorative contractors, such as those that precast concrete countertops, stretch the boundaries on what's too big or heavy to move, developing special rigs to transport massive pieces of their concrete work. Other times, it's just simpler to cast the concrete in place as the precast advantages are outweighed by convenience, such as with concrete slabs and floors. 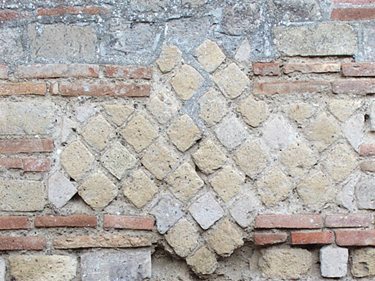 Roman concrete was being precast more than 2000 years ago. Huge precast units can be moved with the proper equipment. Precast fence panels can be cast with form liners and stained. Repetitive parts lend themselves to precasting. Monterey Bay Cast Stone. But highly custom pieces are also precast. Rafter C Precast Concrete. 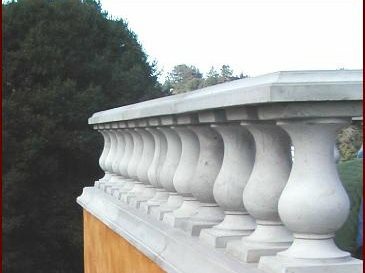 Nearly any decorative finish application can be used with precast, from integral color to stains to exposed aggregate. Precasting lends itself to the use of form liners, especially for architectural panels and rock features. 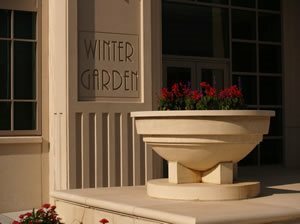 Polishing and engraving is no different with precast than for any concrete surface. Another popular use for precast concrete is large-scale commercial buildings such as apartments, hotels, warehouses or office buildings. However, it is also possible to build smaller scale structures, such as single-family residences using precast concrete. Some of these buildings are built using a tilt-up construction method where concrete panels are cast flat, cured and then raised into position. Others are built with a prefab or modular approach where more complete units are created, delivered to the site and set in place. Precasting offers contractors an opportunity to make more money—to increase the scope of the types of concrete work they can offer their customers. 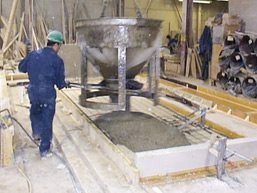 To begin precasting, you will need a shop large enough to accommodate the size of the pieces you intend to precast (or a yard if you intend to precast outside), material storage areas or bins, molds, a mixer sized for the precast products you are making, a way to consolidate the concrete in the molds, and a material handling system. 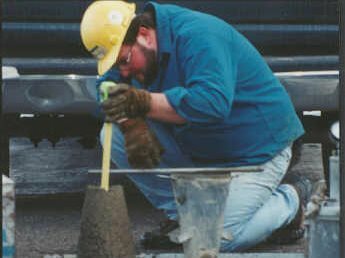 Test concrete workability by performing a slump test. If you are going to manufacture precast products in your shop, you should consider doing your own quality control. Large precast operations have big labs and develop intricate quality procedures, testing all aspects of the concrete both before and after casting and developing extensive QC tools like fishbone charts and scatter diagrams and Pareto charts. You may not need to get to that level, but some basic testing and analysis can save you money both in production costs and higher quality precast products. Starting with good materials is the first step. All aggregate is not acceptable for use in concrete. If there are organic materials, shale, chert, or other soft materials in your aggregate, you can't produce good concrete. Reactive aggregates can lead to alkali-silica reaction that can destroy your concrete. The best defense may be simply to require that the aggregate meets ASTM C 33, "Standard Specification for Concrete Aggregates." It's your aggregate supplier's responsibility to assure that you are getting good aggregate. Sampling the fresh concrete is critical and the simplest test is slump. Although not always the best measure, slump does indicate workability, which Adam Neville, in his book "Properties of Concrete," defines as "the amount of useful internal work necessary to produce full compaction." Slump can vary dramatically, though, when admixtures are used. The best use for slump is to give you some indication of whether the mix will flow easily into the forms and to monitor different batches of the same mix design. All else equal, different slumps indicate different amounts of water, but slump variations can also indicate changes in entrained air content, aggregate moisture, or temperature. The temperature of your concrete is another important thing to test. Cold concrete can set very slowly and will mean waiting longer to strip the molds. Hot concrete gains strength faster, but the ultimate strength will be lower. Higher temperatures can also reduce air entrainment and workability. Hot concrete can lead to cracks as thermal gradients develop. Entrained air content is something you'll have to control for concrete that is to be used outside where it will be exposed to freeze-thaw cycles. Without any air entraining agent, well-consolidated concrete will have an air content of about 2% (this will be entrapped air, not entrained). For concrete that is to be used outside, you will want an air content around 5 to 6%. This is achieved using an admixture called an air entraining agent—basically a soap that makes the concrete froth when mixed. But you need to be careful to control the air content since too much can reduce strength. Air content can be difficult to control and can change from temperature changes, changes in admixtures, and different handling methods. 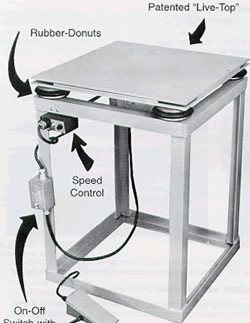 Air content is measured with either a pressure meter or a volumetric meter (also called a roll-a-meter). You can also monitor air content pretty easily just by running unit weight tests (ASTM C 138). Finally, you may also want to monitor the strength of your concrete. 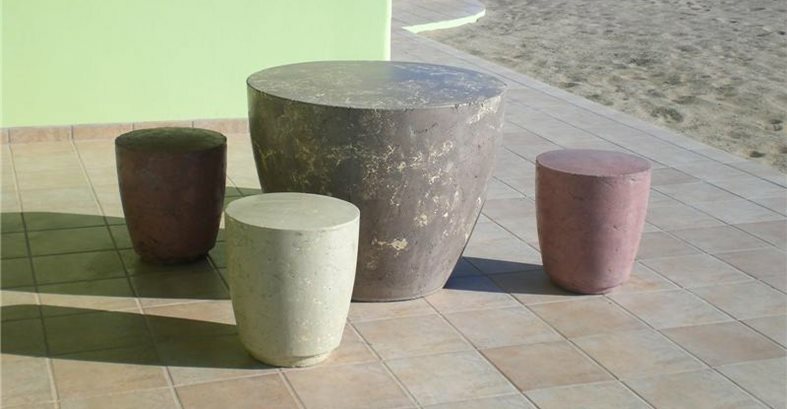 For cast-in-place concrete, 6x12-inch cylinders are standard. You would probably want to send those cylinders to a lab for testing. You can also make 2-inch cubes, following ASTM C 31. Either of these will tell you the compressive strength of the concrete, which is an important indicator. 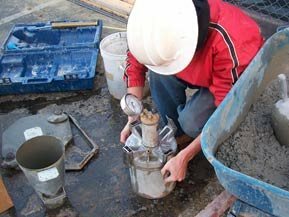 Checking your concrete's compressive strength at various ages, may help you decide when the precast product can be put into service and might also allow you to fine tune your mixes. Weight/size—the weight and size of the unit cast must be something that you have the equipment to handle and move and it can't be too big to move into place at the job site. 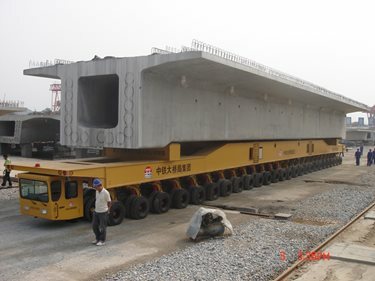 Pull-out—the shape of the precast unit must be such that it can be stripped from the mold or the molds must have the flexibility to handle the shape. Repetition—the more times you will make the same unit, the more effective precasting is as a manufacturing process, although some custom jobs also lend themselves to precasting, especially countertops and furniture. Fiberglass molds are much lighter than steel molds. Blackthorn, Inc. This is an important aspect of precasting: getting used to the idea that you are a manufacturer rather than a contractor. As a manufacturer, you will need to set up work flow procedures, configure your production area, and establish quality control methods. Of course, you do those things on a construction job site too, but since a job site is a temporary operation, you may be content to work around small inconveniences that in a precasting operation could cost you time and money. Material handling is an important part of the operation—we talked about that a little in relation to materials. But you also have to be able to handle molds and the finished product. Lifting systems need to be safe, easy to use, and not damage the finished product. Some proprietary systems have been developed to minimize your space requirements, such as Verti-Crete. Forklifts and overhead cranes are the most common material handling equipment. Used equipment is often a good buy when you are starting a new operation since you can usually get it immediately and at a better price than buying new. Polystyrene molds are convenient but not very durable. Hotwire Direct. Often, lifting inserts are cast into the concrete products. Select inserts that are simple to install and use. 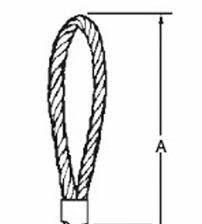 There are many commercially manufactured inserts available made from reinforcing steel, steel cable (prestressing strand), or plastic. For precast products that will be outdoors, steel should be galvanized to prevent corrosion. An advantage of commercially manufactured insets is that they have been designed for their rated load. Homemade lifting inserts are cheaper but if one fails, falling precast concrete is very dangerous. Some precast products may lend themselves to the use of special clamps or slings designed just for that product. Size your mixer to match the size of your castings and the type of concrete you plan to cast. Molds can be a big expense in a precast operation. Steel molds are available from companies like Del Zotto or Norwalk Precast Molds. 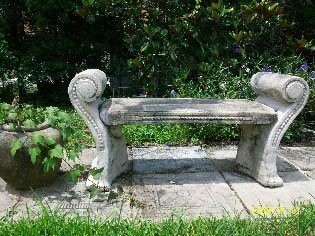 These are more commonly used for large precast items, like septic tanks or burial vaults. 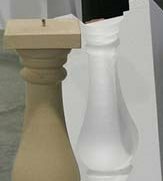 Molds of expanded polystyrene work well, but will only get a couple of uses—one source for polystyrene baluster or column molds is Hotwire Direct. Most decorative molds are custom made using melamine and rubber—see Concrete Molds for more on that. You can also get someone else to make custom molds for you—such as Architectural Precast Inc. Molds can incorporate form liners and various insets and blockouts—remember that the geometry must allow stripping. Coat your molds with a form release agent prior to casting concrete. Be careful with block outs, since some materials can react with some form release agents. The best release agents are reactive releases that form a metallic soap to aid in mold removal. Some plastic or melamine molds may be slick enough to demold without a release agent. Proper consolidation of your precast products is the only way to get good surface finishes and the required strength and durability. In precasting it is much easier to test and perfect your consolidation methods than it is on a job site. Any concrete mix will typically have about 20% entrapped air coming out of the mixer. Consolidation gets that air out, increasing the concrete density which improves bond, increases strength, and reduces permeability—it also eliminates surface voids and bubbles. A good way to consolidate precast, especially smaller products, is with vibrating tables. The better vibrating tables eliminate any dead spots and can consolidate the concrete in seconds. Some even come with a foot pedal to turn the vibration on, and with controls to adjust both vibration frequency and amplitude to fine tune it for a specific product. Other vibrators used are internal pencil vibrators (stingers) and form vibration (external vibrators mounted on the outside of the forms). Curing the precast products is critical to getting the quality you want. Protect your precast products from the sun and wind during curing and make sure they have adequate moisture. One good curing method is simply to leave the concrete in the forms. But if you must strip, especially in hot dry weather, maintain high humidity in the curing area. Most decorative precasters use a wet-casting method, as opposed to dry-cast. Wet-cast means that the concrete has a water-cement ratio of about 0.4 or higher. 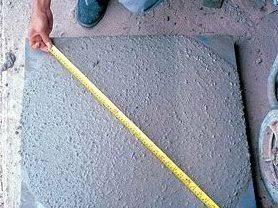 Dry-cast concrete is very dry (w/c of 0.30 to 0.36), has zero slump, and the forms can be stripped as soon as the concrete has been consolidated. 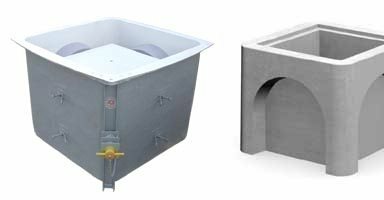 Dry-casting requires an expensive dry-casting machine and is typically used for mass production of products like concrete pipe or manholes and also in concrete block production. The big advantage of dry-casting is that you only need one set of forms to mass produce a specific part, since the form can be stripped immediately. Prevent cross contamination between bins. APM Automation Solutions. 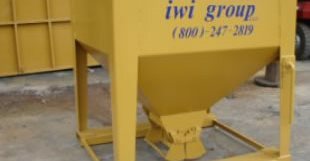 There are two ways to get concrete for your precasting operation—have ready-mixed concrete delivered or make your own concrete in your shop. In general, most decorative precasters make their own concrete. That allows them to make only as much as they need and to more carefully control the characteristics and quality. But if even you are only making small batches, you will need to maintain stock piles of the various ingredients, which include aggregate—in various sizes, cement and other cementitious materials, admixtures, and reinforcement. Controlling the quality of the materials is critical, both before they arrive and after. Start with your aggregates which will make up the largest portion of the concrete and take up the most room for storage. Keep the different sizes of aggregate separate so you can blend them as needed for each casting job. Make sure the aggregate sizes don't segregate during storage. Bins are available for aggregate or you can just keep aggregate in piles. Either way, you need to be able to control the moisture content and prevent contamination—make sure dirt isn't dug up with the aggregate and that adjacent aggregate stockpiles don't cross contaminate one another. The moisture content of the aggregate can have a big impact on the workability of the concrete and its water-cement ratio. Ideally, aggregate is kept in a state of saturated surface dry (SSD) meaning the rock is wet on the inside but just barely dry on the surface. Load your bins with a front-end loader and maintain about a two-day supply. Larger precast operations use conveyors to fill their bins. Cement, on the other hand, must be kept completely dry—for obvious reasons. Even moist air will allow some of the cement to hydrate, reducing its strength and leading to clogging of the bins. Fly ash isn't as sensitive to moisture, but still needs to be kept dry to flow easily. 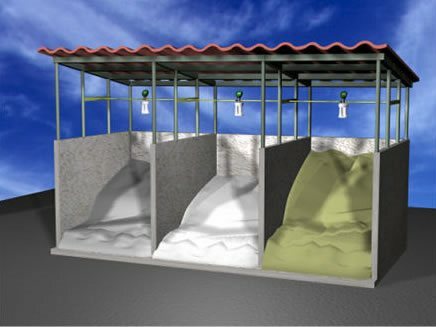 Both cement and fly ash can be purchased in bags or delivered by bulk and moved by fluidizing with air. Admixtures come as liquids or powders and should be clearly marked. Liquid admixtures should not be allowed to freeze, since that can damage some materials. Powdered admixtures in water-soluble packets are a good approach for smaller operations. Remember that most liquid admixture dosages are specified in fluid ounces per hundred pounds of cement (fl oz/cwt) not on a cubic yard basis. Reinforcing steel also needs to be protected from contamination. This usually means just not storing it on the ground. 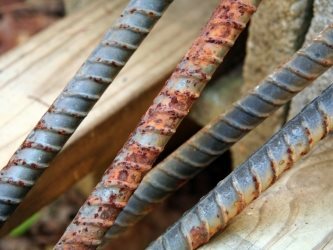 A little rust on the surface doesn't damage the steel—in fact some research suggests that slightly rusted surfaces provide better bond. Fiber reinforcement typically comes in toss-in degradable bags. Sef-consolidating concrete is highly flowable and can spread as much as 30 inches. Note that there is no segregation or bleeding. Self consolidating concrete (sometimes called self compacting), or SCC, is a dream material for precasters. Not only does it virtually eliminate the need for vibrators, it allows much higher pour rates and fewer workers, results in glassy smooth surfaces, and can provide the finest of details in the casting. SCC is a very high-slump, flowable concrete—but it's not as simple as just adding a dose of water and some high-range water reducer (superplasticizer). A true SCC must also be "stable," meaning that the mix doesn't segregate into paste and aggregate portions. True SCC requires a mix with higher fines content, low water-cement ratio, a well-graded aggregate blend, and doses of a polycarboxylate high-range water reducer and, usually, a viscosity-modifying admixture (VMA). The mix must be carefully worked out, but once it has been established in a precast plant setting, you should be capable of achieving consistent results. Work with your materials suppliers to develop a mix design and do a lot of experimentation before going live with this. 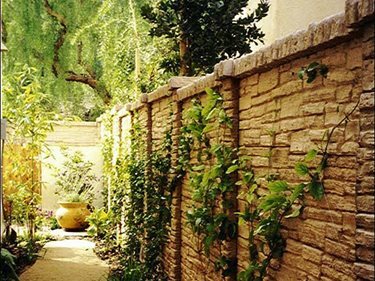 Glass fiber reinforced concrete has become popular among small-scale precasters because it is lightweight, strong and doesn’t require additional reinforcement. 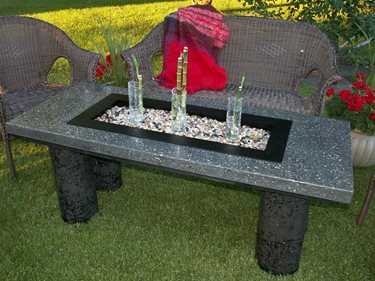 It is used to create countertops, ornamental concrete, artificial rocks, statues, planters, fountains and more. GFRC can be poured or sprayed into a variety of molds or forms.